keShop package offers functionality necessary to deploy dynamic website with content subscription management. 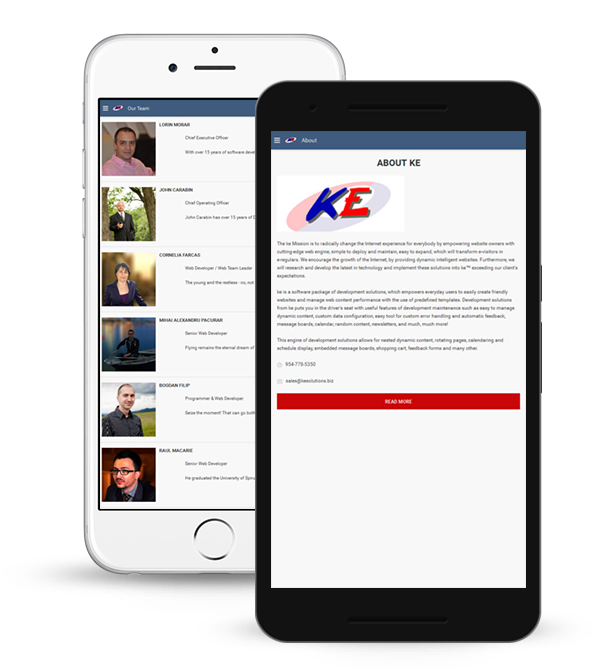 With the keShop package, you are prepaying for necessary items such as bandwidth usage SQL server, keEngine and storage, as well as additional components to provide more compelling presentation of your website on the internet. Some of the add-on functionality includes feedback forms, newsletters, random content, message boards, content promo and user account management, product account management, product directory and rating system. With product directories you can easily categorize your products on your website. You can deploy feedback forms or even message boards attached to certain products for people to discuss their experiences. You can provide detailed information and even product "homepage" or feature item on your welcome page with content promo feature. You can specify location of the product in multiple places in the directory to facilitate easy navigation. Product could be anything you want it to be, even link to another website. With ke package you can even download web search catalog featuring many thousand categories. With keShop package you will be able to make modifications to your website. You will no longer need to pay yet another fee to your existing web design company just to correct a spelling mistake. You will be empowered to publish your own webpages. All functionality in your package is ready to be deployed on your website, you do not have to wait for your guru guy to find time to actually implement your newsletters or your feedback forms. It's all in here and ready to use. Content directory is a nice way to showcase your offering or categorize website links. You can use content directory to even promote your customer's products and feature products with content promo module. Major feature of the system is clear upgrade path. If one day you decide that you must have, for example, shopping cart integration with multiple credit card processors, this functionality can be added to your website almost instantly (once you agree on design layout). In the course of successful web development, you will face need to implement new functionality. With keShop you rest assured that functionality is maintained and that you do not need to spend large sums of money to upgrade to one of the additional modules already available via the upgrade path. The overall TCO is kept low at manageable monthly fees and out-of-pocket expenses for development of new modules are minimized or entirely eliminated. With keShop you can rest assured that ongoing development improves your website's performance and addresses any concerns or issues that may arise without the need for you to pay new development fees.